In order to configure the system, system administrators often need to determine the amount of free memory, how much free disk space is available, how the hard drive is partitioned, or what processes are running. The ps command allows you to display information about running processes. It produces a static list, that is, a snapshot of what is running when you execute the command. If you want a constantly updated list of running processes, use the top command or the System Monitor application instead. For a complete list of available command line options, refer to the ps(1) manual page. The top command displays a real-time list of processes that are running on the system. It also displays additional information about the system uptime, current CPU and memory usage, or total number of running processes, and allows you to perform actions such as sorting the list or killing a process. Interactive top commands contains useful interactive commands that you can use with top. For more information, refer to the top(1) manual page. Kills a process. You are prompted for the process ID and the signal to send to it. Changes the number of displayed processes. You are prompted to enter the number. Sorts the list by user. Sorts the list by memory usage. Sorts the list by CPU usage. Terminates the utility and returns to the shell prompt. The Processes tab of the System Monitor tool allows you to view, search for, change the priority of, and kill processes from the graphical user interface. To start the System Monitor tool, either select Applications System Tools System Monitor from the Activities menu, or type gnome-system-monitor at a shell prompt. Then click the Processes tab to view the list of running processes. For each listed process, the System Monitor tool displays its name (Process Name), current status (Status), percentage of the memory usage (% CPU), nice value (Nice), process ID (ID), memory usage (Memory), the channel the process is waiting in (Waiting Channel), and additional details about the session (Session). To sort the information by a specific column in ascending order, click the name of that column. Click the name of the column again to toggle the sort between ascending and descending order. refresh the list of processes. edit the System Monitor preferences, such as the refresh interval for the list of processes, or what information to show. You can also end a process by selecting it from the list and clicking the End Process button. For a complete list of available command line options, refer to the free(1) manual page. The Resources tab of the System Monitor tool allows you to view the amount of free and used memory on the system. To start the System Monitor tool, either select Applications System Tools System Monitor from the Activities menu, or type gnome-system-monitor at a shell prompt. Then click the Resources tab to view the system’s memory usage. In the Memory and Swap History section, the System Monitor tool displays a graphical representation of the memory and swap usage history, as well as the total amount of the physical memory (Memory) and swap space (Swap) and how much of it is in use. 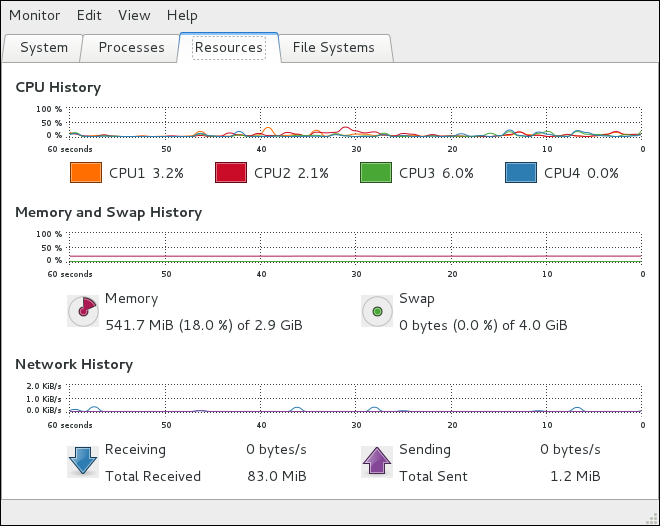 The Resources tab of the System Monitor tool allows you to view the current CPU usage on the system. To start the System Monitor tool, either select Applications System Tools System Monitor from the Activities menu, or type gnome-system-monitor at a shell prompt. 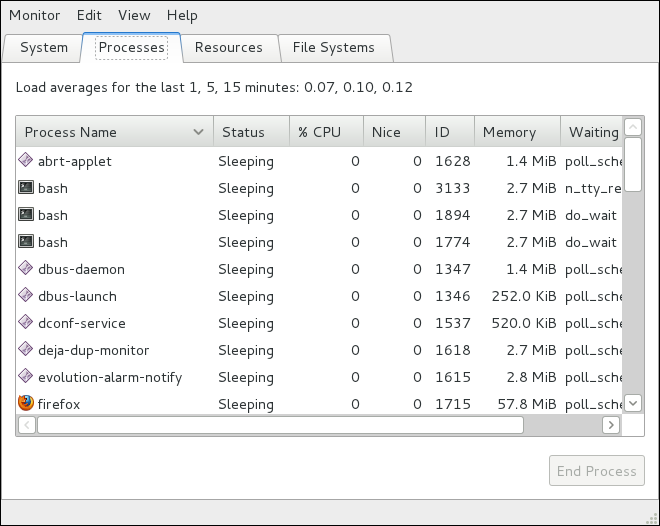 Then click the Resources tab to view the system’s CPU usage. In the CPU History section, the System Monitor tool displays a graphical representation of the CPU usage history and shows the percentage of how much CPU is currently in use. For a complete list of available command line options, refer to the lsblk(8) manual page. For a complete list of available command line options, refer to the blkid(8) manual page. For a complete list of available command line options, refer to the partx(8) manual page. For a complete list of available command line options, refer to the findmnt(8) manual page. Note that the /dev/shm entry represents the system’s virtual memory file system, /sys/fs/cgroup is a cgroup file system, and /run contains information about the running system. For a complete list of available command line options, refer to the df(1) manual page. For a complete list of available command line options, refer to the du(1) manual page. The File Systems tab of the System Monitor tool allows you to view file systems and disk space usage in the graphical user interface. To start the System Monitor tool, either select Applications System Tools System Monitor from the Activities menu, or type gnome-system-monitor at a shell prompt. Then click the File Systems tab to view a list of file systems. For each listed file system, the System Monitor tool displays the source device (Device), target mount point (Directory), and file system type (Type), as well as its size (Total) and how much space is free (Free), available (Available), and used (Used). For a complete list of available command line options, refer to the lspci(8) manual page. Bus 008 Device 003: ID 04b3:3025 IBM Corp.
For a complete list of available command line options, refer to the lsusb(8) manual page. For a complete list of available command line options, refer to the pccardctl(8) manual page. For a complete list of available command line options, refer to the lscpu(1) manual page. Fedora 26 includes the Net-SNMP software suite, which includes a flexible and extensible Simple Network Management Protocol (SNMP) agent. This agent and its associated utilities can be used to provide performance data from a large number of systems to a variety of tools which support polling over the SNMP protocol. This section provides information on configuring the Net-SNMP agent to securely provide performance data over the network, retrieving the data using the SNMP protocol, and extending the SNMP agent to provide custom performance metrics. The Net-SNMP software suite is available as a set of RPM packages in the Fedora software distribution. Available Net-SNMP packages summarizes each of the packages and their contents. The SNMP Agent Daemon and documentation. This package is required for exporting performance data. The netsnmp library and the bundled management information bases (MIBs). This package is required for exporting performance data. SNMP clients such as snmpget and snmpwalk. This package is required in order to query a system’s performance data over SNMP. The mib2c utility and the NetSNMP Perl module. An SNMP client library for Python. Note that you must have superuser privileges (that is, you must be logged in as root) to run this command. For more information on how to install new packages in Fedora, refer to ../package-management/DNF.adoc#sec-Installing. The net-snmp package contains snmpd, the SNMP Agent Daemon. This section provides information on how to start, stop, and restart the snmpd service, and shows how to enable or disable it in the multi-user target unit. For more information on the concept of target units and how to manage system services in Fedora in general, refer to ../infrastructure-services/Services_and_Daemons.adoc#ch-Services_and_Daemons. This will enable the service in the multi-user target unit. This will disable the service in the multi-user target unit. This will cause the running snmpd service to reload the configuration. To change the Net-SNMP Agent Daemon configuration, edit the /etc/snmp/snmpd.conf configuration file. The default snmpd.conf file shipped with Fedora 26 is heavily commented and serves as a good starting point for agent configuration. This section focuses on two common tasks: setting system information and configuring authentication. For more information about available configuration directives, refer to the snmpd.conf(5) manual page. Additionally, there is a utility in the net-snmp package named snmpconf which can be used to interactively generate a valid agent configuration. Note that the net-snmp-utils package must be installed in order to use the snmpwalk utility described in this section. Net-SNMP provides some rudimentary system information via the system tree. For example, the following snmpwalk command shows the system tree with a default agent configuration. The Net-SNMP Agent Daemon supports all three versions of the SNMP protocol. The first two versions (1 and 2c) provide for simple authentication using a community string. This string is a shared secret between the agent and any client utilities. The string is passed in clear text over the network however and is not considered secure. Version 3 of the SNMP protocol supports user authentication and message encryption using a variety of protocols. The Net-SNMP agent also supports tunneling over SSH, TLS authentication with X.509 certificates, and Kerberos authentication. To test the configuration, use the snmpwalk command with the -v and -c options. … where user is a username and OID is the SNMP tree to provide access to. By default, the Net-SNMP Agent Daemon allows only authenticated requests (the auth option). The noauth option allows you to permit unauthenticated requests, and the priv option enforces the use of encryption. The authpriv option specifies that requests must be authenticated and replies should be encrypted. The Net-SNMP Agent in Fedora provides a wide variety of performance information over the SNMP protocol. In addition, the agent can be queried for a listing of the installed RPM packages on the system, a listing of currently running processes on the system, or the network configuration of the system. This section provides an overview of OIDs related to performance tuning available over SNMP. It assumes that the net-snmp-utils package is installed and that the user is granted access to the SNMP tree as described in Configuring Authentication. The Host Resources MIB included with Net-SNMP presents information about the current hardware and software configuration of a host to a client utility. Available OIDs summarizes the different OIDs available under that MIB. Contains general system information such as uptime, number of users, and number of running processes. Contains data on memory and file system usage. Contains a listing of all processors, network devices, and file systems. Contains a listing of all running processes. Contains memory and CPU statistics on the process table from HOST-RESOURCES-MIB::hrSWRun. Contains a listing of the RPM database. For more information about HOST-RESOURCES-MIB, see the /usr/share/snmp/mibs/HOST-RESOURCES-MIB.txt file. In particular, the ssCpuRawUser, ssCpuRawSystem, ssCpuRawWait, and ssCpuRawIdle OIDs provide counters which are helpful when determining whether a system is spending most of its processor time in kernel space, user space, or I/O. ssRawSwapIn and ssRawSwapOut can be helpful when determining whether a system is suffering from memory exhaustion. 1024 Bytes 1021588 388064                  ? 1024 Bytes 2045580 388064                  ? 1024 Bytes 1021588  31048                  ? 1024 Bytes  216604 216604                  ? 1024 Bytes 1023992      0                  ? 4096 Bytes 2277614 250391                  ? 4096 Bytes  127698      0                  ? 1024 Bytes  198337  26694                  ? The OIDs under HOST-RESOURCES-MIB::hrStorageSize and HOST-RESOURCES-MIB::hrStorageUsed can be used to calculate the remaining capacity of each mounted file system. The Net-SNMP Agent can be extended to provide application metrics in addition to raw system metrics. This allows for capacity planning as well as performance issue troubleshooting. For example, it may be helpful to know that an email system had a 5-minute load average of 15 while being tested, but it is more helpful to know that the email system has a load average of 15 while processing 80,000 messages a second. When application metrics are available via the same interface as the system metrics, this also allows for the visualization of the impact of different load scenarios on system performance (for example, each additional 10,000 messages increases the load average linearly until 100,000). A number of the applications that ship with Fedora extend the Net-SNMP Agent to provide application metrics over SNMP. There are several ways to extend the agent for custom applications as well. This section describes extending the agent with shell scripts and Perl plug-ins. It assumes that the net-snmp-utils and net-snmp-perl packages are installed, and that the user is granted access to the SNMP tree as described in Configuring Authentication. The Net-SNMP Agent provides an extension MIB (NET-SNMP-EXTEND-MIB) that can be used to query arbitrary shell scripts. To specify the shell script to run, use the extend directive in the /etc/snmp/snmpd.conf file. Once defined, the Agent will provide the exit code and any output of the command over SNMP. The example below demonstrates this mechanism with a script which determines the number of httpd processes in the process table. The Net-SNMP Agent also provides a built-in mechanism for checking the process table via the proc directive. See the snmpd.conf(5) manual page for more information. Integer exit codes are limited to a range of 0–255. For values that are likely to exceed 256, either use the standard output of the script (which will be typed as a string) or a different method of extending the agent. Executing shell scripts using the extend directive is a fairly limited method for exposing custom application metrics over SNMP. The Net-SNMP Agent also provides an embedded Perl interface for exposing custom objects. The net-snmp-perl package provides the NetSNMP::agent Perl module that is used to write embedded Perl plug-ins on Fedora. The OID .1.3.6.1.4.1.8072.9999.9999 (NET-SNMP-MIB::netSnmpPlaypen) is typically used for demonstration purposes only. If your organization does not already have a root OID, you can obtain one by contacting your Name Registration Authority (ANSI in the United States). When getMode returns MODE_GET, the handler analyzes the value of the getOID call on the request object. The value of the request is set to either string_value if the OID ends in ".1.0", or set to integer_value if the OID ends in ".1.1". If the getMode returns MODE_GETNEXT, the handler determines whether the OID of the request is ".1.0", and then sets the OID and value for ".1.1". If the request is higher on the tree than ".1.0", the OID and value for ".1.0" is set. This in effect returns the "next" value in the tree so that a program like snmpwalk can traverse the tree without prior knowledge of the structure. The type of the variable is set using constants from NetSNMP::ASN. See the perldoc for NetSNMP::ASN for a full list of available constants. To learn more about gathering system information, refer to the following resources. ps(1) — The manual page for the ps command. top(1) — The manual page for the top command. free(1) — The manual page for the free command. df(1) — The manual page for the df command. du(1) — The manual page for the du command. lspci(8) — The manual page for the lspci command. snmpd(8) — The manual page for the snmpd service. snmpd.conf(5) — The manual page for the /etc/snmp/snmpd.conf file containing full documentation of available configuration directives.